Lancashire (LRE.L) is a London quoted specialty insurer that writes short tail (mainly insurance) business in aviation, marine, energy, property catastrophe and terrorism classes. Set up after Hurricane Katrina, the company operates a high risk high reward business model, tightly focussed by the experienced hand of CEO Richard Brindle, with an emphasis on disciplined underwriting, tight capital management and generous shareholder returns. Shareholder’s equity is managed within a range between $1 billion and $1.5 billion with numerous shareholder friendly actions such as special dividends resulting in a cumulative shareholder return of 177% since the company’s inception over 7 years ago. I am a fan of the company and own some shares, although not as many as in the past. I like their straight forward approach and their difference in a sector full of firms that seem to read from each other’s scripts (increasingly peppered with the latest risk management speak). That said, it does have a higher risk profile than many of its peers, as a previous post on PMLs illustrated. That profile allows it to achieve such superior shareholder returns. The market has rewarded Lancashire with a premium valuation based upon the high returns achieved over its short history as a March post on valuations showed. However, over the past 6 months, Lancashire’s share price has underperformed against its peers, initially due to concerns over property catastrophe pricing pressures and more recently it’s announcement of the purchase of Lloyds of London based Cathedral Capital. Cathedral’s results over the past 5 years have been good, if not in the same league as Lancashire’s, and the price paid by Lancashire at 160% of net tangible assets is not cheap. Given the financing needs of the acquisition, the lack of room for any of Lancashire’s usual special dividend treats in the near term has been a contributing factor to the recent share price declines in my opinion. 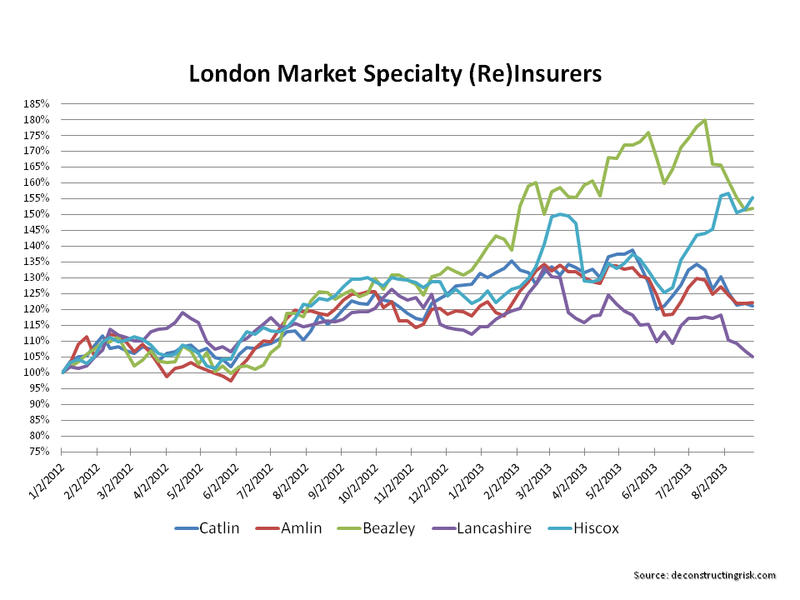 Based upon the proforma net tangible assets of Lancashire at end Q2 as per the Cathedral presentation and the circular for the share offering, the graph below shows the net tangible valuation multiples of a number of the London market insurers using net tangible asset values as at end Q2 with market values based upon todays’ closing prices. 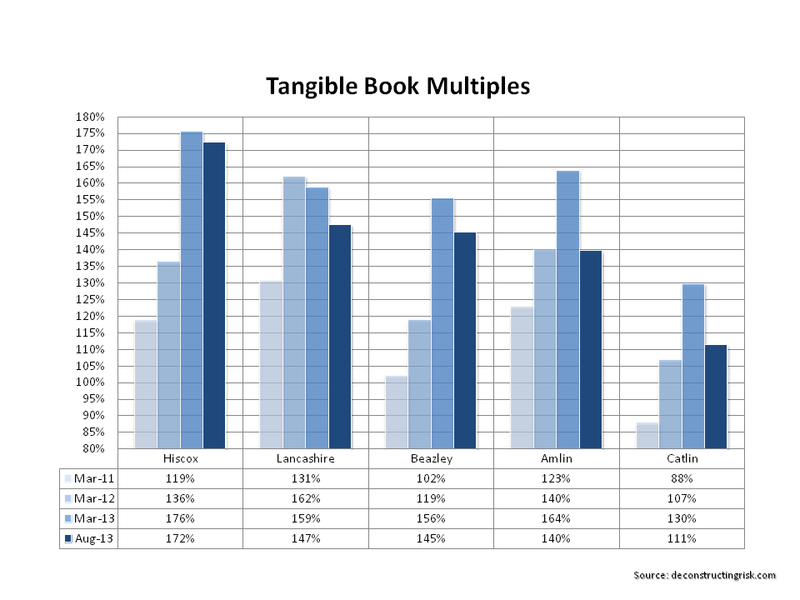 The multiples show that the market is now valuing Lancashire’s business at a level more akin to its peers rather than the premium valuation it previously enjoyed. Clearly, the acquisition of Cathedral raises questions over whether Lancashire will maintain its uniqueness in the future. That is certainly a concern. Also, integrating the firms and their cultures is an execution risk and heading into the peak of the US wind session could prove to be unwise timing. Notwithstanding these issues, Brindle is an experienced operator and I would suspect that he is taking full advantage of the current arbitrage opportunities (as outlined in another post). It may take a quarter or two to fully understand the impact of the Cathedral acquisition on Lancashire’s risk/reward profile. I, for one, look forward to stalking the company to find an attractive entry point for increasing my position in anticipation of the return of Lancashire’s premium multiple. This entry was posted in Insurance Firms, Investing Ideas and tagged Amlin, Cathedral Capital, Catlin, Hiscox, insurance price tangible book value, Lancashire, Lancashire specialty insurer, net tangible asset, price tangible book values, price to tangible book value, Richard Brindle, shareholder returns, special dividend, tangible book value, tangible book value multiples. Bookmark the permalink.